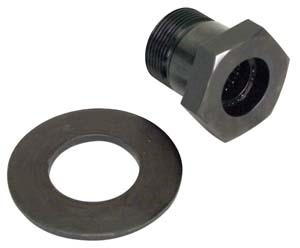 Our chrome finished pulley bolt and washer adds the finishing touch to all crank pulley installations. 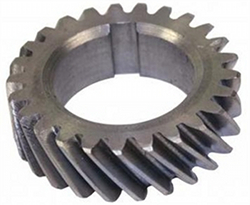 Extra long bolt must be used with bolt-in sand seal pulleys. Fits all Volkswagen 40hp 1200-2332cc Type 1 engines and Vanagon 83-92 1.9L & 2.1L engines. They have been inspected and are in good used condition. Increase horsepower with precision timing and valve settings with this High grade polished aluminum VW standard size crankshaft pulley that fits all Type 1s. Full 360 degree timing marks, screened on with a special process for longetivity. 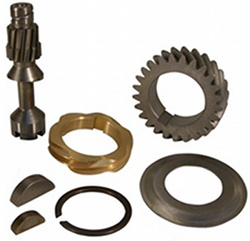 Don't take a chance on stock gland nuts in high performance applications. This ultra strong bad boy is made from 4130 chromoly. 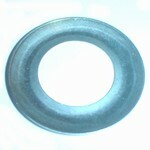 The extra strength chromoly and concave spring steel washer provide maximum holding power. Fitted with special pre-greased needle bearing and grease seal. Compatible with stock 4 dowel pin and 8 dowel pin flywheels and features a 36mm nut size, NOT a 1 7/8"
Features a 5-hole design with black timing marks. 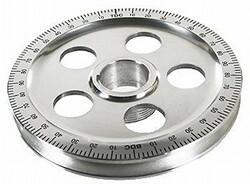 Features a 5-hole design with red timing marks. Increase horsepower thru precision timing and valve settings with this bolt-on Volkswagen high grade polished aluminum degree crankshaft power pulley! Reground Type 1 1600ccO.E. German Forged Crankshaft. Reground to Mains 10, Rods 10. Original Type 1 40hp crankshaft that has been cleaned, polished and checked for straightness. Original Type 1 36hp crankshaft that has been cleaned, polished and checked for straightness. For 1300, 1500 and 1600cc engines. The heart of any performance engine is the crankshaft. 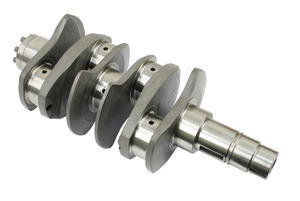 Counterweighted crankshafts greatly reduce power robbing and damaging crank flex, high rpm, harmonics and vibration through the entire power range. EMPI's counterweighted crankshafts are perfect for a racer on a budget. These cranks are precision ground, micro-polished, nitrided and balanced. 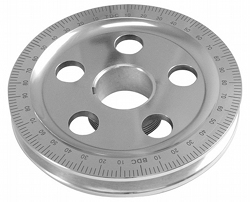 Features include: forged from 4140 chromoly, radiused standard/standard journals, chamfered oil holes, 8 dowel, 8mm dowel pins and cross-drilled. Note: uses VW stock main and rod bearings. EMPI has developed this high quality counterweighted stroker crank with the serious racer in mind. Multiple die stamp forged from 4340 chromoly. Cranks are the magna fluxed, shot peened and all journals are nitrided, precision ground and micro polished. Additional features include cross-drilled chamfered oil holes, dynamic balancing, 8 dowel and extra long 8mm dowel pins. Note: stroker cranks require machining of case and possibly other internal components for rod clearance. EMPI has developed this high quality counterweighted stroker crank with the serious racer in mind. Multiple die stamp forged from 4340 chromoly. Cranks are the magna fluxed, shot peened and all journals are nitrided, precision ground and micro polished. Additional features include cross-drilled chamfered oil holes, dynamic balancing, 8 dowel and extra long 8mm dowel pins pins.